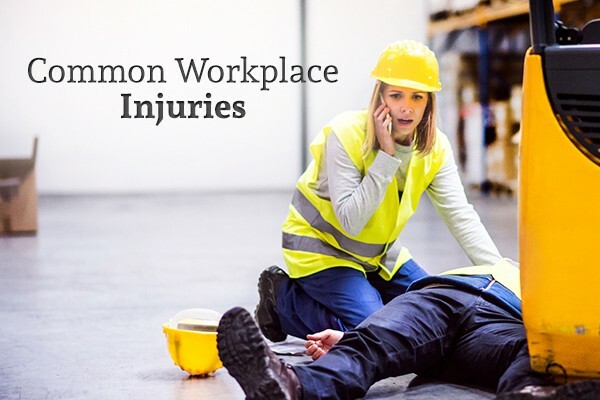 Most Common Workplace Injuries | Juan Hernandez Law, P.C. The Bureau of Labor Statistics lists the following occupations as having the highest numbers of injuries in 2015: laborers/material handlers, tractor trailer/heavy truck drivers, cleaners/janitors, nursing assistants, and general maintenance/repair workers. While some work-related injuries are specific to the occupation, certain injuries are common in most jobs. Workplace accidents involving slips and falls and lifting excessively heavy items improperly often result in serious, painful back injuries. A workplace injury involving fractured vertebrae has the potential to cause long-term health problems for the worker. Fracturing vertebrae means that one or more spinal bones have sustained a break, causing local or radiating pain. The area in which the break occurred will be sore to the touch and swell visibly, producing a noticeable lump on the spine. Pinched nerves or paralysis could result if the back injury is severe and complex. Tearing or overstretching your back’s soft tissue, muscles, or tendons can cause strains or sprains. Strains and sprains may happen if you vigorously lift something too heavy or if you twist your back improperly while lifting something above your knees. Thick, flexible pads of tissue called intervertebral discs lie in between bony vertebrae comprising your spine. If a disc moves out of place because you were injured on the job, it can bulge outward from between vertebrae and press against sensitive spinal nerves. Symptoms of herniated disc pain include pain radiating down the back of one leg (sciatica), numbness and tingling in the legs, and/or feet and back weakness. Unsecured objects falling onto a worker’s head commonly cause injuries in the construction or manufacturing industries. “Closed” head injuries do not pierce the skill; “open” head injuries occur when something has broken through the skull and possibly injured the brain. Head injuries in the workplace often lead to contusions, hematomas (bleeding in the brain), and concussions. Work-related musculoskeletal injuries encompass a variety of painful, sometimes debilitating conditions affecting the nerves, tendons, muscles, and joints. Tendonitis, carpal tunnel syndrome, tension neck, and thoracic outlet syndrome are a few examples of common musculoskeletal injuries suffered by workers on the job. Doctors group musculoskeletal injuries into several categories: repetitive motion injuries, occupational cervicobrachial disorders, soft tissue disorders, and regional musculoskeletal disorders. Workers employed in industries requiring the use of strong chemicals or heavy dust are susceptible to a variety of health issues that may not be initially apparent but could emerge years later or even after they have retired. Decades of exposure to irritating fumes and solvents without proper preventative measures can damage lungs, tissues, eyes, and even tumors in some cases. Any of these medical problems may be viable causes for workers compensation, especially if the employer did not provide safeguards against these potential health hazards. The personal injury lawyers at Juan Hernandez Law can help you receive the compensation you need to pay your bills while recuperating from injuries due to workplace accidents. If your employer has denied your request for workers compensation, they will aggressively pursue your compensation claim to help you obtain the financial assistance you deserve. To schedule a free consultation with one of our personal injury attorneys, call our office today.